Interested in the theme song's lyrics? Download a PDF as well as the ZBZ mission and sing along with the intro. Download Mission and Theme Song Lyrics here. Animation research was conducted for a series of motion and visual effects tests for the TV show The Adventures of ZooBugs-Zoom. A combination of 2D and 3D techniques are being combined together to create the globetrotting endeavors of our insect comrads. The official website for The Adventures of ZooBugs-Zoom is still in the conceptual design stage. With many fantastic designs on the table already, the launch in the fall of 2010 will be an exciting one. Perhaps what you are viewing now will be a strong contender or, at least, very influential to the final look. 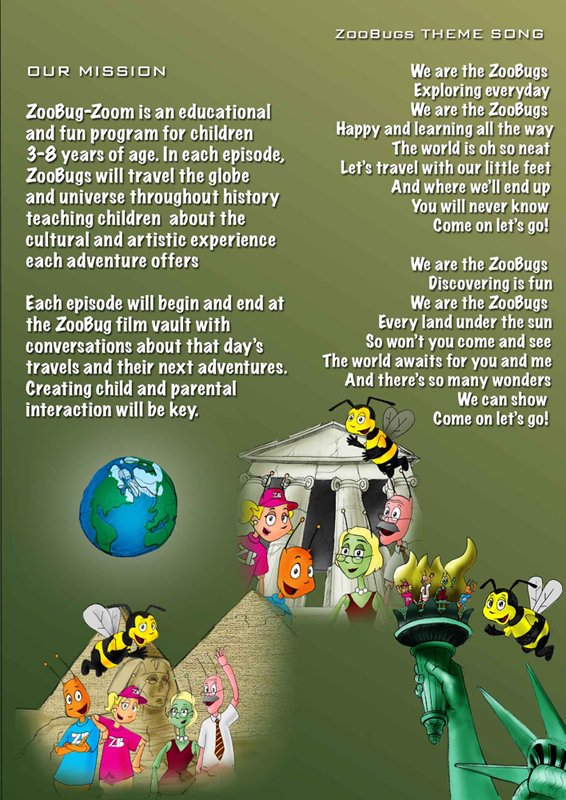 Did you know that you can keep track of the latest adventures of the ZooBugs by following Twitter? Check it out now and see what the team is up to as they share interesting facts about the world around us.